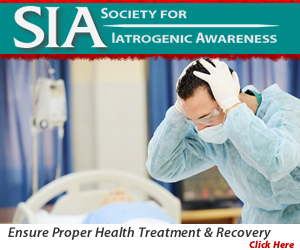 Terms of Services provided by Society of Iatrogenic Awareness (SAI) applies to all users of the Service, including contributors of Content on the Service. “Content” includes audio, text, software, scripts, graphics, photos, music, videos, audiovisual combinations, interactive features and other materials you may view on, access through, or contribute to the Service. The Service includes all SAI products, services and software, including audio and video players, digital uploaders, download applications, live broadcast features, and other applications. The Service contains links to third party websites that are not owned or controlled by SAI. It is understood that SAI has no control over, and assumes no responsibility for, the content, privacy policies, or practices of any third party websites; and cannot censor or edit the content of any third-party site. By using the Service, you expressly relieve SAI from any and all liability arising from your use of any third-party website. You understand that when using the Service, you will be exposed to Content from a variety of sources, and that AAI is not responsible for the accuracy, usefulness, safety, or intellectual property rights of or relating to such Content. You further understand and acknowledge that you may be exposed to Content that is inaccurate, offensive, indecent, or objectionable, and you agree to waive, and hereby do waive, any legal or equitable rights or remedies you have or may have against SAI with respect thereto, and, to the extent permitted by applicable law, agree to indemnify and hold harmless SAI, its owners, operators, affiliates, licensors, and licensees to the fullest extent allowed by law regarding all matters related to your use of the Service. WHO PAYS FOR MEDICAL ERRORS?